When it comes to searching files or file types, there is no match to File Explorer in Windows 10. 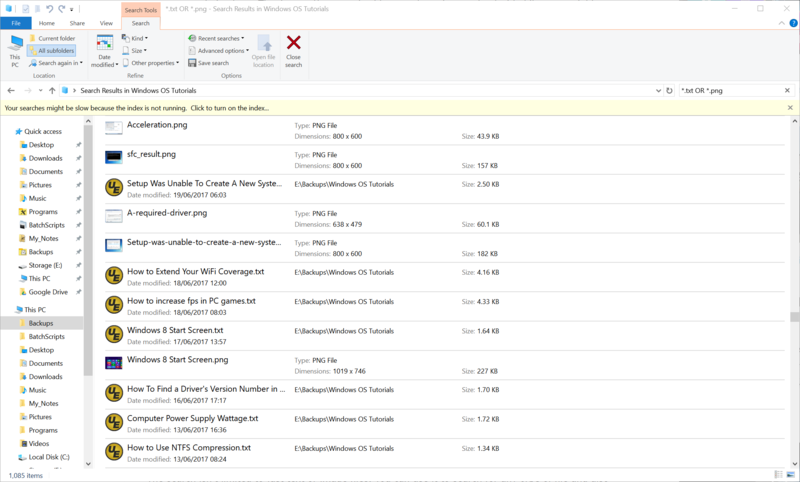 You can search by file types, multiple file types at a time in File Explorer. The key to this easy multiple file type searching is the ‘OR’ search modifier. Whenever you are searching for multiple file types, you have to type the file types separated by OR. The keyword OR is case sensitive, which means, OR and or are not same. If you type or/Or/oR instead of OR, then the command will not work. 1. Open File Explorer and go to any drive or folder. 2. Now if you want to find text or png files, then type the following command.You will be able to find all TXT and PNG files in a folder or drive. The search isn’t limited to just text or image files. You can use it to search for any type of file and also with the file name. In that case, you must write the correct file name and this situation is not case sensitive.